This entry was posted on Monday, April 25th, 2011 at 8:53 pm	and is filed under design, favourite, urban planning. You can follow any responses to this entry through the RSS 2.0 feed. You can leave a response, or trackback from your own site. I have one exactly like that one sitting on the shelf (in the box) waiting for ants. I got it for the 4 year old for his birthday… Totally still exist. Although now you can buy blue goo ones. At some point I lost all my bookmarks, I have just spent the last 5 minutes free associating and trying so hard to remember the name of your blog. I had vague memories of old posts, but lo and behold, I found it. Rebecca, where did you get it? And where does one buy an ant colony? Glad you’re back. But I think they are on Ye Olde Amazon too. 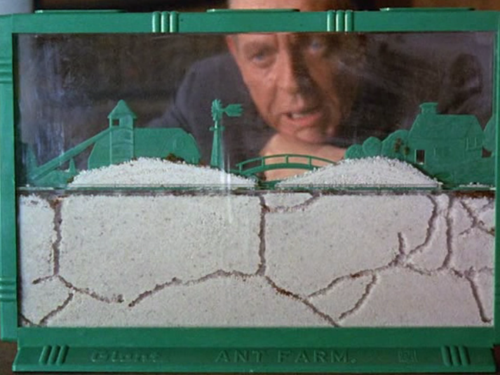 I still have to order the ants from http://unclemilton.com/ant_farm/. Awesomely, antfarm.com redirects to that site. And yes, happy to find you again. Seriously random neuron firings led me back.